As you’re reading this, invisible cosmic rays are relentlessly bombarding the earth’s surface, smashing into and tearing apart molecules, and creating new radioactive elements. This bizarre-o process is how cosmogenic radionuclides are born in rocks very near to the earth’s surface (cosmo-, from in the cosmos, -genic, originating process). The longer a rock is exposed to cosmic radiation at the earth’s surface, the greater the concentration of radionuclide that is accumulated. Short exposure time=lower concentrations. Long exposure time=higher concentrations. If this poor, unassuming rock is buried, however, cosmogenic radionuclide accumulation will halt. 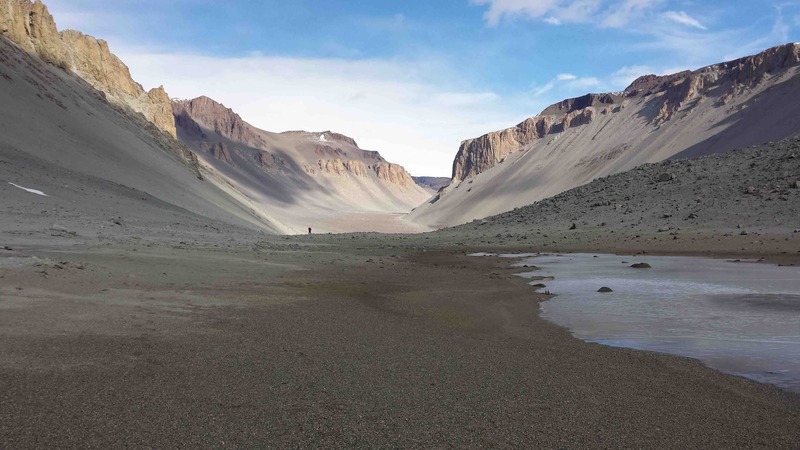 Glaciers are particularly good at blocking cosmic radiation from reaching the bedrock over which they slide and, here in the McMurdo Dry Valleys, we have sampled that exact bedrock that was once covered by overriding glacial ice. We will take these samples back to the U.S. with us and measure itty bitty concentrations of cosmogenic radionuclides that are contained within. Sidebar: What’s an “itty bitty” concentration? Glad you asked. We are typically measuring element concentrations on the order of millions of atoms. That may sound like a lot, but don’t be fooled! Take a commonly measured cosmogenic radionuclide (and my personal favorite), beryllium (Be). 1 gram of Be contains more than 1 sextillion atoms. That’s more than 1 billion trillion atoms…in just 1 gram of the stuff! That means that the concentrations we measure represent about 0.00000000000000001% of 1 gram of Be! It’s ok – it blows my mind, too. 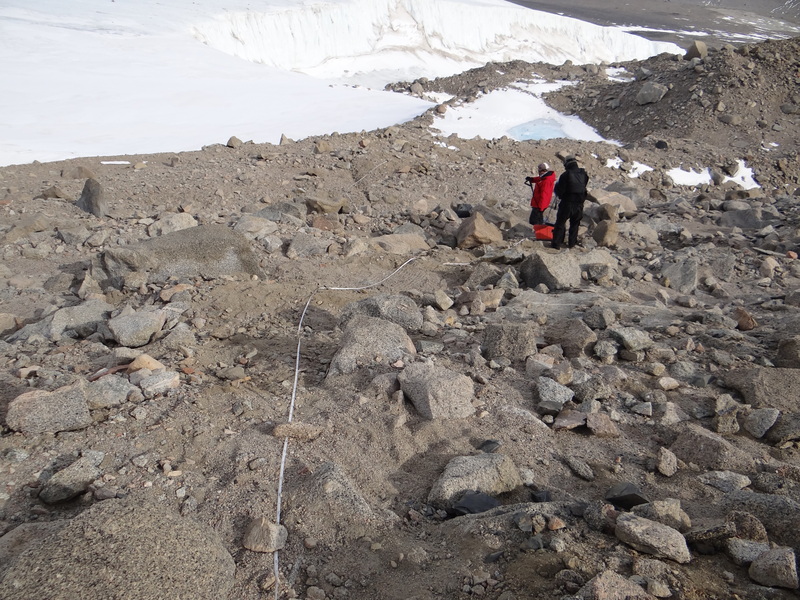 The exposure history of these rocks help us better understand how glaciers have grown and shrunk in the past. 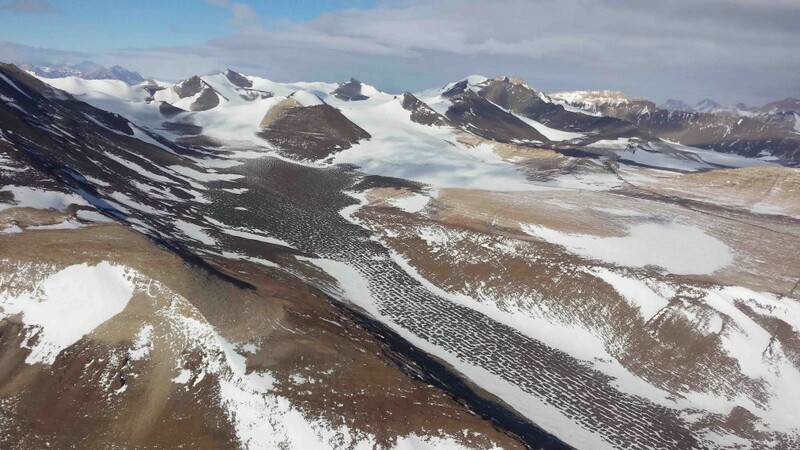 In turn, these changes in glacial behavior help us interpret changes in the climate and what the Dry Valleys region may have looked like long before we arrived here. 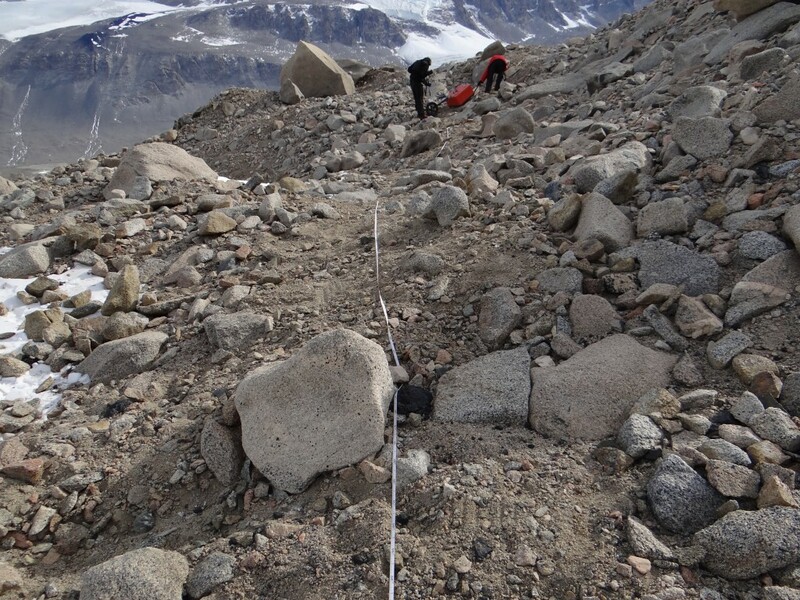 A common sampling technique is to target large boulders that have been pushed to the glacier’s furthest extent. 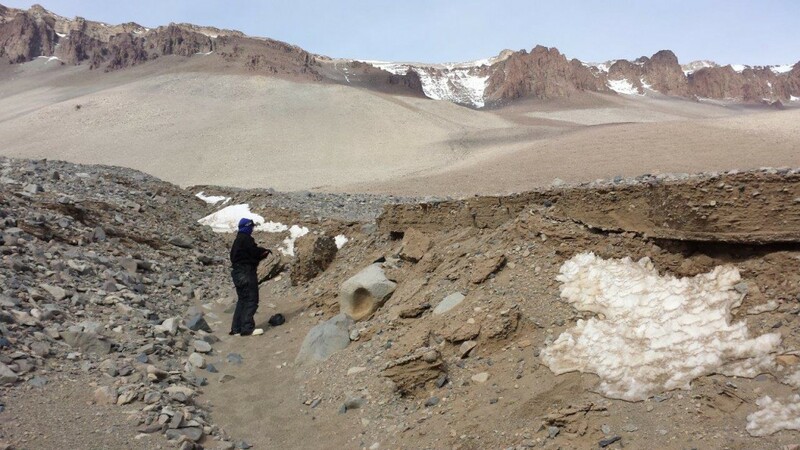 Unfortunately, many small cirque glaciers in the Dry Valleys do not move such massive rocks. Here, in Dipboye Cirque, upper Wright Valley, we’re testing a new technique on meter-scale boulders. 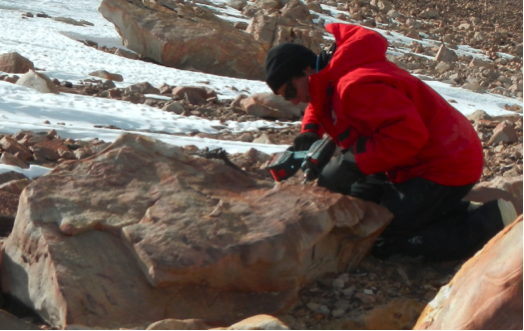 We use a rock drill to set wedges and shims into the rock surface then we hammer away with a sledge until the rock surface pops loose for us to collect. The technique is adapted from stone masonry – and has earned me the unfortunate nickname “The Destroyer”. This is The Destroyer, clear. To the outside observer, some of our team’s actions over the past few weeks would seem quite bizarre. On certain days, we start by dragging out a long tape measure across the rocky ground. 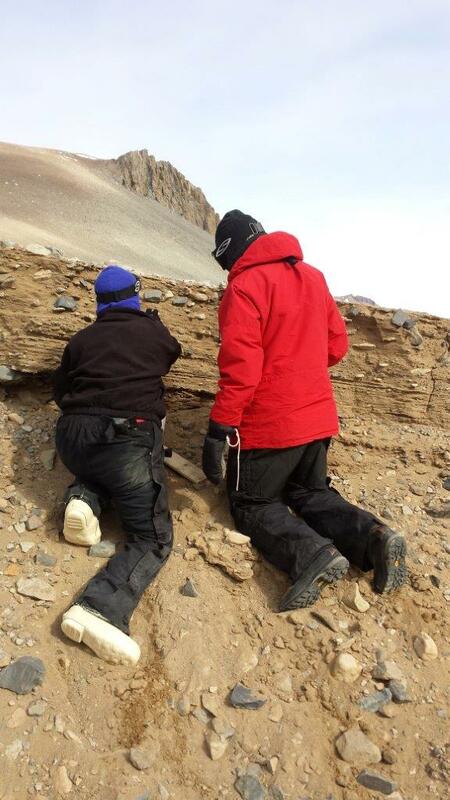 Next, the team moves along the tape measure and casts the surface rocks aside. 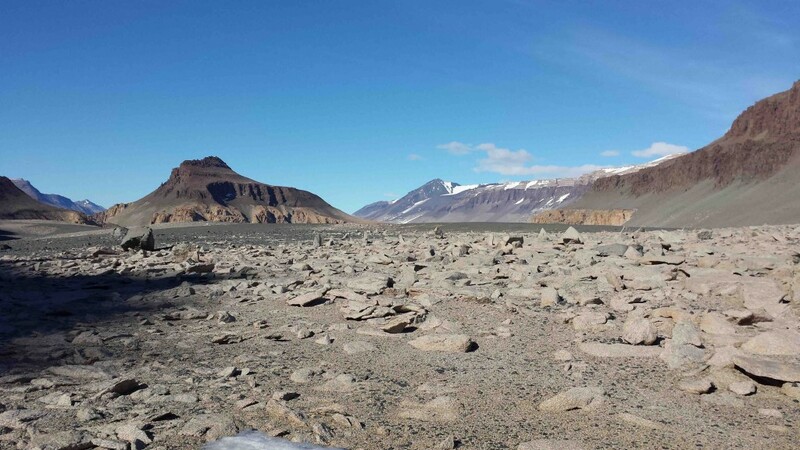 Now, in the Dry Valleys, on the rock glaciers these rocks, as the name implies, cover almost the entire surface. Some rocks are big; some are small; and some are huge. 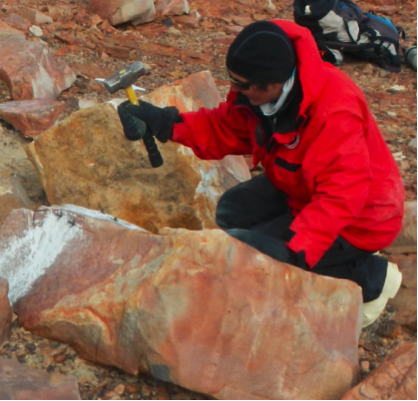 With pickaxes, muscle power, and determination, we cast the rocks to the side to expose a primarily sandy surface. 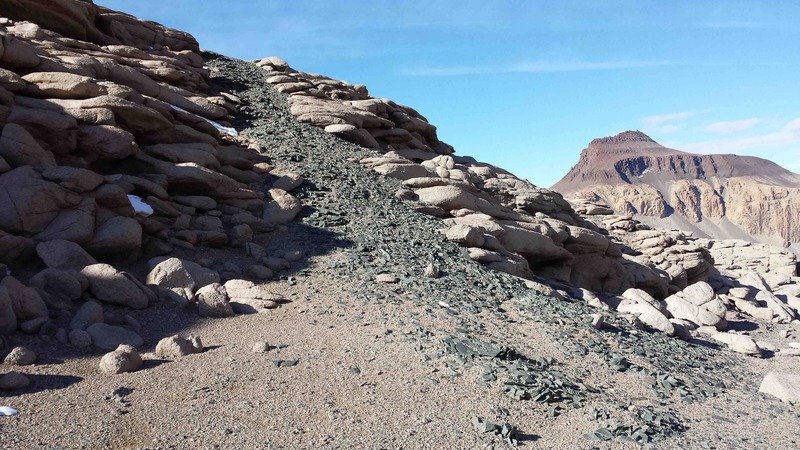 Rough calculations indicate that we move about ten thousand pounds of rocks for every three hundred feet we clear! 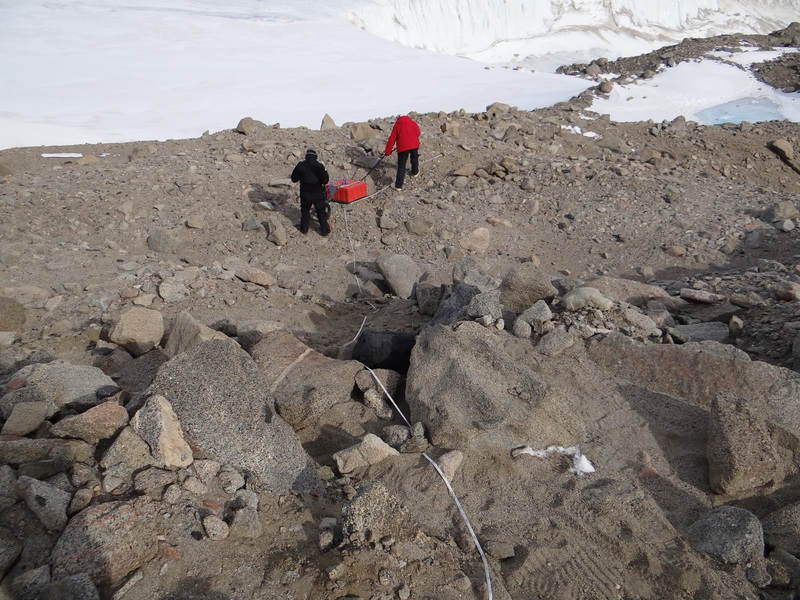 After the rock moving, the team drags an orange box along the ground in the cleared path. Generally one person drags the box from the front, while another person behind it guides its path. A third person carries a computer which is attached to the orange box via a long blue cable. As you may guess from the title of this post, the orange box is in fact a ground-penetrating radar antenna. As you may also guess from the description, the radar system operates at a frequency that allows the radar waves to penetrate into the ground. With some electrical engineering and computer wizardry, we can interpret the recorded results to estimate where subsurface objects and layers occur. So why would we use this scientific tool in our research? Well, in many places we have cored into ice below the ground, or excavated soil pits to identify soil layers and “ice cement,” or frozen sediments. 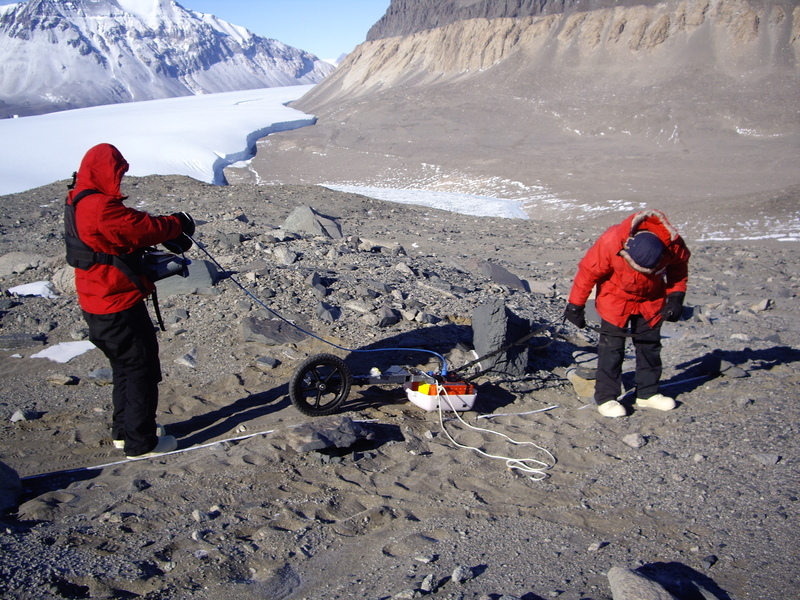 With the ground-penetrating radar results, we can sometimes extrapolate the individual ice core and soil results to identify larger area of ice and/or rock in the ground. By using the radar, we can survey larger areas the fewer intrusions into the ground. This approach saves time, effort, and money while providing valuable scientific information. There is one final thing about the field work and data collection. An outside observer may think our final action during data collection is the strangest one. After we drag the orange antennas down the survey line, the team moves back down the line and throws the rocks back onto it. So first we move the rocks away, then afterwards we move the rocks back! This last step aims to reduce our environmental footprint by minimizing the signs of our survey. Although science is a vital part of the human quest for knowledge, we first and foremost aim to preserve this amazing continent, unspoiled, for future generations. It’s best to leave some extra space in the top of your pee bottle. 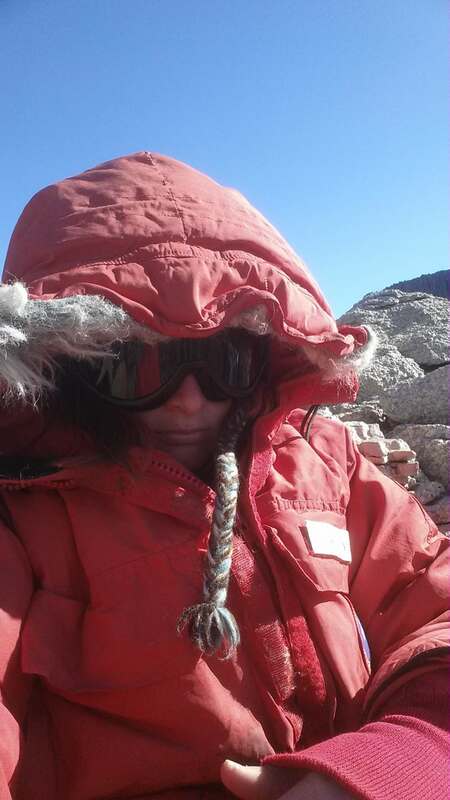 Then when the pee freezes and expands during the course of a day of field work, there is still available space in the top to pour in some boiling water to melt it once you arrive back at camp. After being worn for a week straight, socks emit a particularly foul odor. 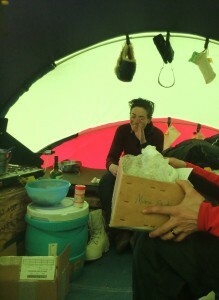 Do not dry your socks on the cook stove during dinner, or risk the wrath (and potential vomit) of your tent mates. Magazines from home are worth their weight in silver. When a package with magazines arrives in camp, the magazines are immediately and thoroughly investigated by all camp personnel. G-085 thanks their friends and family for all the mail; we love you! One must stake down the tents ten times as well as a newbie in Antarctica might suppose. Also, throw some rocks on the tent and on those stakes. Once you think there are enough rocks and stakes holding your tent down, add ten more rocks to each side. If you don’t secure the tent properly, Antarctica may treat you to the site of your tent blowing down valley in a wind storm, with all your belongings strewn behind it. We have arrived at our final camp site of the season: the South Fork of Upper Wright Valley. 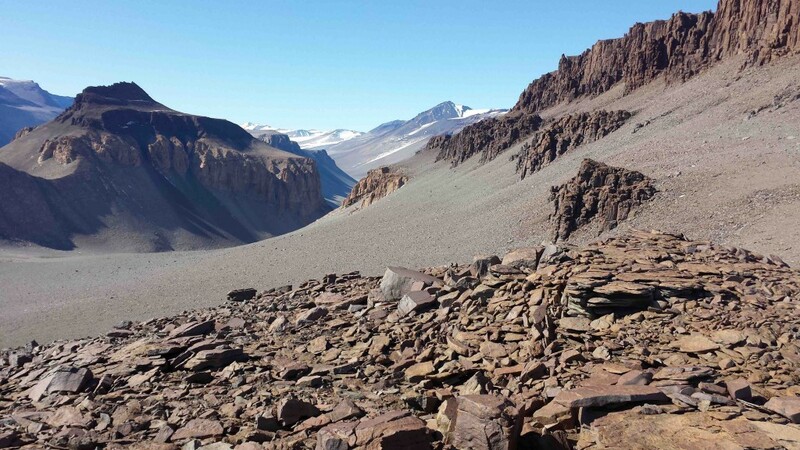 Not entered by Griffith Taylor and his field team during Robert Falcon Scott’s expeditions 100 years ago, Wright Valley was first explored in the late 1950s by Colin Bull and three other young New Zealand geologists. 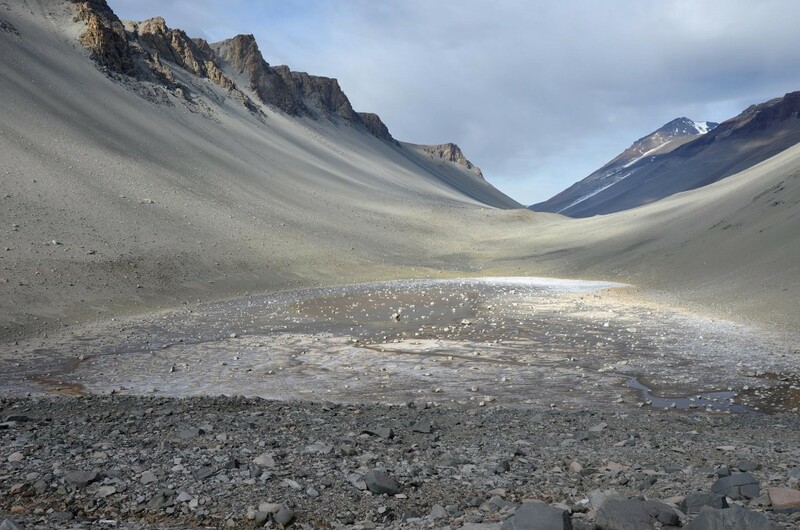 Soon after, in October of 1960, the U.S. Navy’s VXE6 flight squadron observed a small pond in South Fork that, unlike all other bodies of water here in the Dry Valleys, was not covered by ice. 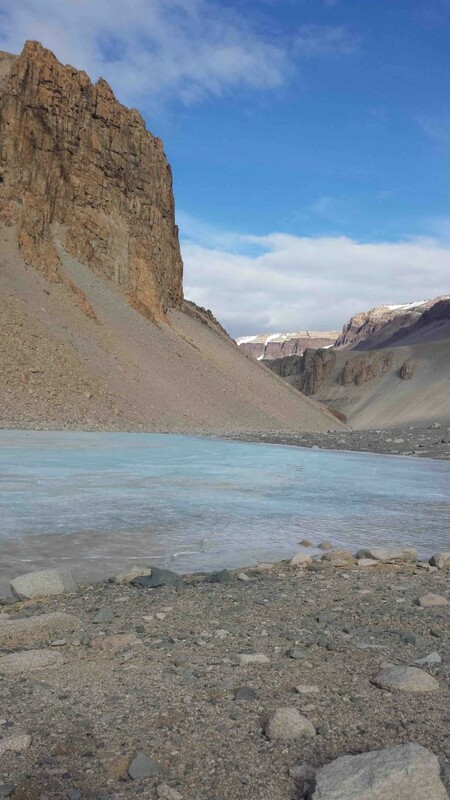 What they encountered later became known as Don Juan Pond, the saltiest body of water in the world. 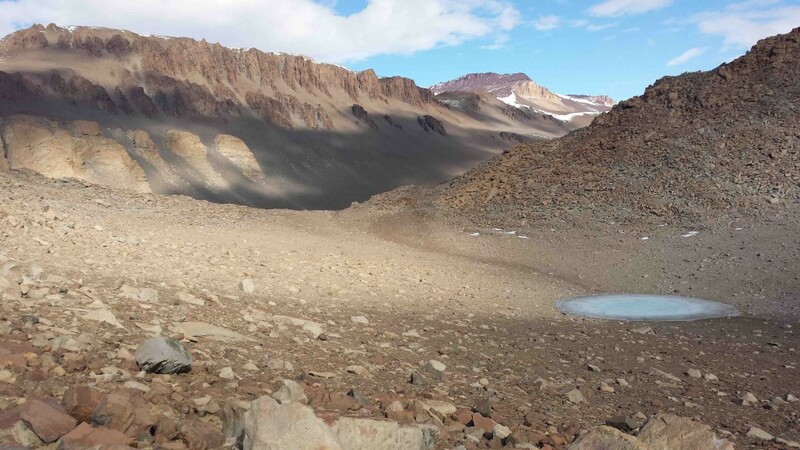 Don Juan Pond quickly became a provocative location for biologists, hydrologists and geochemists trying to understand how liquid water can exist throughout the entire year in one of the coldest places on Earth. 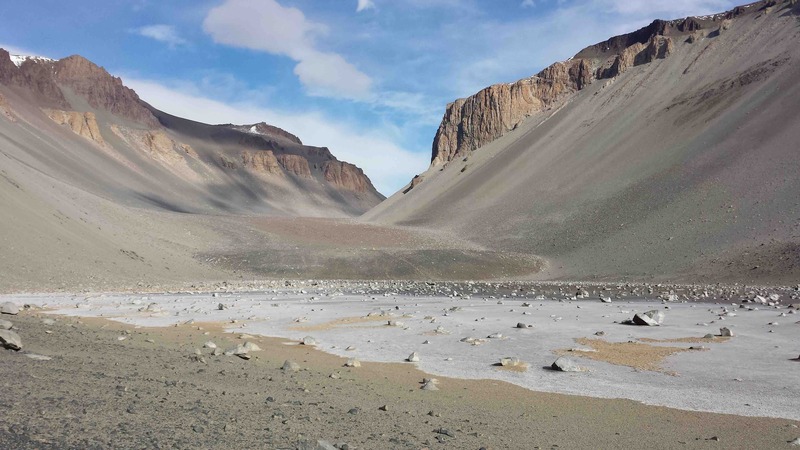 After more than half a century, we still have fundamental questions regarding whether life can actually exist in Don Juan Pond and what is responsible for such a high concentration of salt. 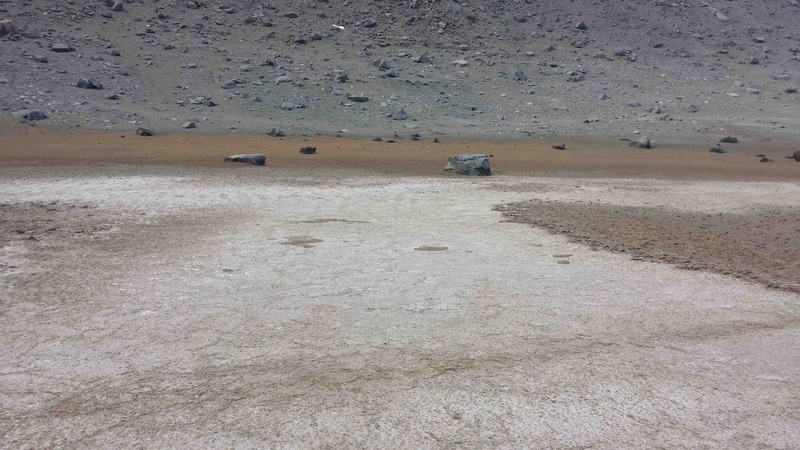 The pond also prompts us to speculate about the potential for a similar body of water to exist on Mars, where hyper saline brines may be flowing today, and liquid water was far more plentiful in the ancient past. 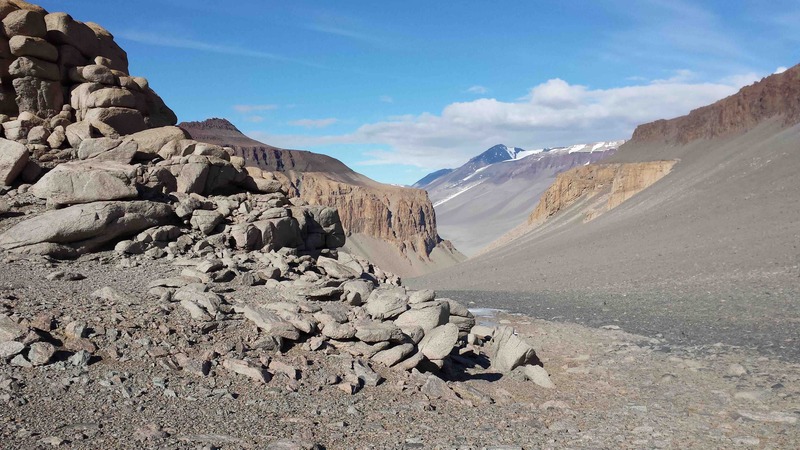 While we are camped just a few hundred meters west of Don Juan Pond, our primary target of interest this season is an unusual rock-covered lobe that abuts the western boundary of the pond. 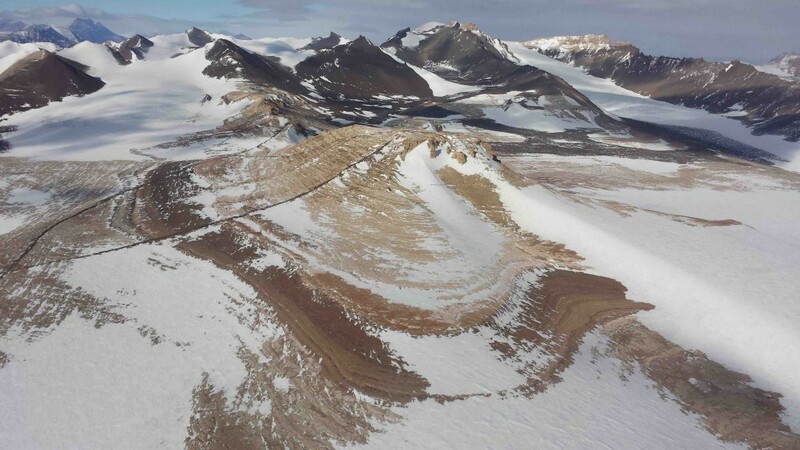 Many similar lobes in the Dry Valleys have clean ice buried just under a thin cover of rock and soil (“debris-covered glaciers”), but no scientist has ever documented ice in this lobe. Instead, if you dig a pit anywhere on it, you’ll find what we call ice cement: frozen soil cemented together by small amounts of water. Is it possible that this lobe formed in the absence of massive clean ice? 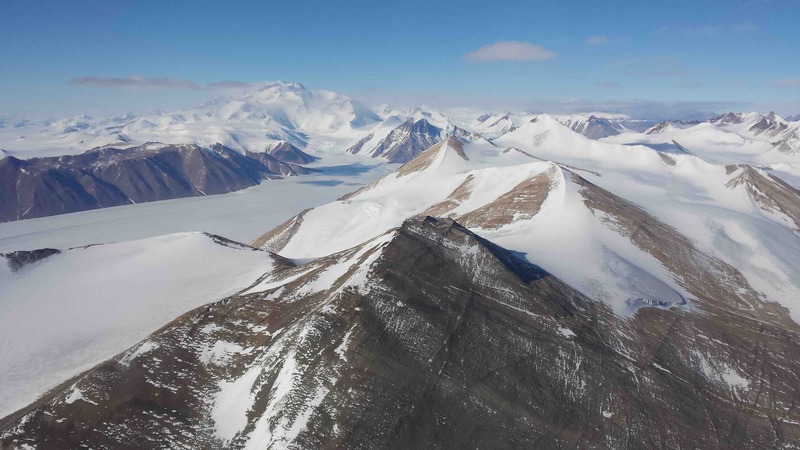 Or did it form as a typical Dry Valley glacier then lose almost all of its ice when the climate changed? If so, why didn’t other glaciers elsewhere here lose all of their ice? 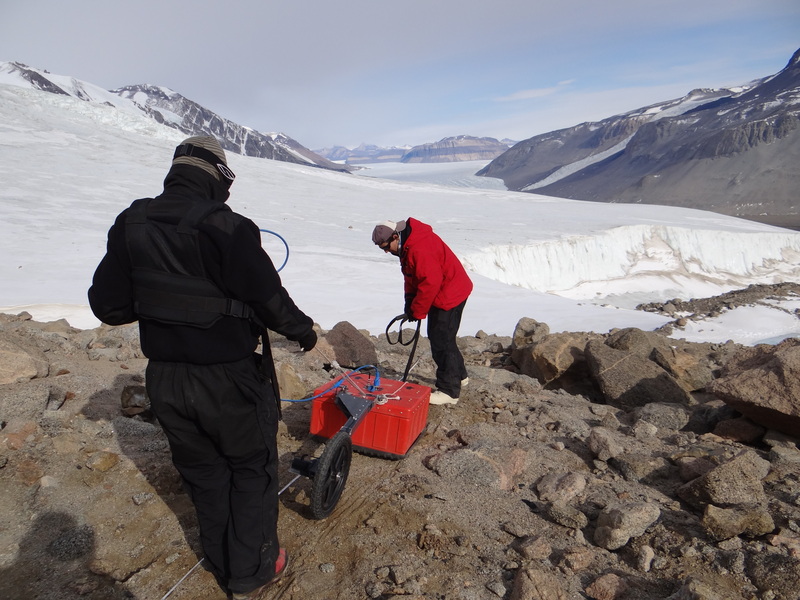 We’ve been taking samples and running Ground Penetrating Radar (GPR) scans to help image the subsurface to see if there is ice buried at a greater depth. When we compare these data to data we’ve collected at our previous sites, we may be able to answer some of these questions. Morale has been quite high of late, as we have received several care packages from home, containing plenty of treats for us all to share. An extra special one was sent to us by Ms. Choe’s 4th grade class in Plano, TX. Each student took the time to send us a card with fantastic drawings of Antarctica and Mars, and several questions about what it is like to live down here and what it’s like to be a scientist. We’ve had fun every night after dinner writing down answers to their questions, which will soon be put onto a helicopter and sent all the way back to Texas. Thanks so much for the package, Ms. Choe’s class! I am too tired to write a proper blog post about today’s trip, but what you really want are some photos. I hiked a couple hours westward, toward the end of The Dias. It is most excellent up there. Looking east across dolerite sills. Me, hiding from the wind is a strugglebus. Aphanitic dike cobbles. It is a land to fall in love with. Granitic rocks weather out all rounded. Sweet dolerite dike intruding into granitics. Granitic cliffs weathering to orange. The upper portion of Wright Valley is divided in two by the imposing bedrock cliffs of The Dias. To the south is South Fork, and to the north is North Fork, fancy that. Rachel, Kate, and I got a helo lift up to the upper slopes of North Fork, where there’s this isolated, tiny little pond glowing all blue amidst the orange rock. At the edge of a cliff looking into upper South Fork. The cliff is made of a dolerite dike next to a granitic host rock. Tiny pond nestled in talus. Looking toward North Fork. I sampled there for a bit, while Kate and Rachel hoofed it downhill to dig sediment pits. It’s a wonderful thing, feeling completely alone on a ridge, surrounded by silence and rocks. I in fact became quite giddy, and had a fabulous day working downhill and to the east in a sampling transect. There’s a definite feeling of exploration. I mean, yes, other people have been there, but it doesn’t feel like they have. You feel like you’re discovering everything, and I think that that gives you a slight sense of…not quite ownership, but maybe an enhanced sense of place. Curiosity is at its peak when I’m hiking a new (to me) place while searching for interesting spots to sample. You notice more, when you’re looking for sampling sites. And North Fork has so much sampling potential! 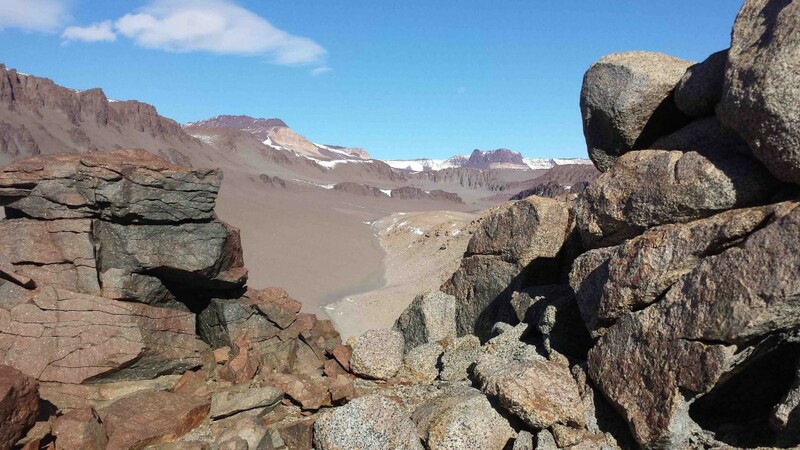 It’s hard to constrain yourself from just waltzing up every ridge to see if there’s more to sample across the way. But, prioritizing samples is actually part of the fun. Salty old dried up pond. Salt! It makes these little ripple-like forms on the surface of the lake bed. 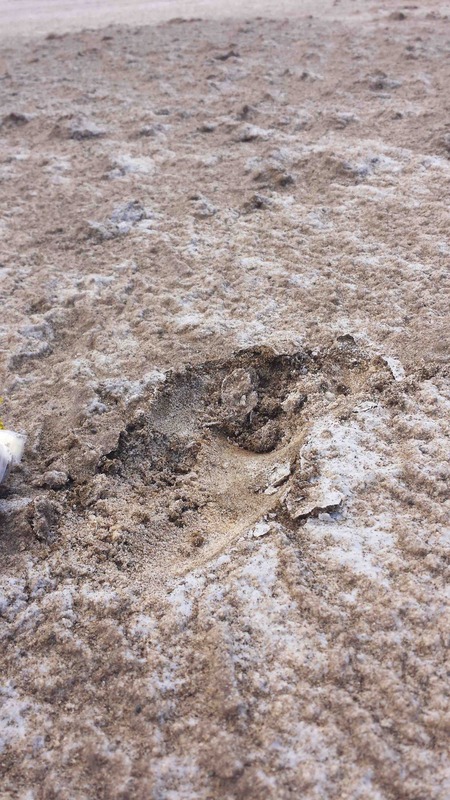 Digging into salty lake bed to find…more salt. First activity in South Fork = getting some samples in a big gulley cutting into a sediment fan leading into the valley. Jay and his compatriot, Garreth (sp? ), have done a bunch of work here, so the two primary gullies are unofficially named…Garreth’s Gulley and Jay’s Gulley. Garreth has somehow claimed the bigger of the two, so we’re in Garreth’s Gulley. And that’s how things get named. The questions are: when was the fan deposited? How long does it take to build up a decent-sized fan like this? To answer, we need to find out when the sediments were buried. In some cases, sediment burial ages can be determined using a technique called Optically Stimulated Luminescence, or OSL. This basically determines how long it’s been since the sediment—usually sand—has been exposed to sunlight. Because uncovering the buried sand to the sun would reset its clock, we have to get at sand that hasn’t been exposed in the gulley walls. This means hammering a PVC tube into the cliff and retrieving the deeper material. Team members trying to insert PVC pipe into a somewhat stubbornly cemented wall. Success! We got a nice profile of samples into the cliff, and Jay even had a chance to do some precision photography of the eroding gulley wall. Although Jay has been to South Fork each of his eight seasons in Antarctica, the rest of us needed to get a feel for the valley. We spent Saturday hiking a ways east of Don Juan Pond, and then back west up the main part of the viscous flow lobe we’re camped on. Don Juan Pond is ringed by salt crusts, making boulders stand out white against the lake when the light hits them right. It’s quite beautiful. Orange-ish areas near the lake are thin little algal mats. 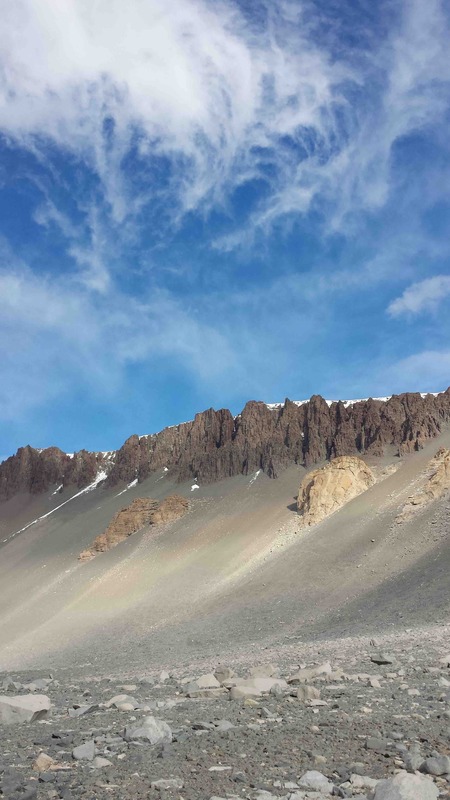 Looking across Don Juan Pond onto the viscous flow lobe and our campsite. As you travel east from Don Juan, you go up a fairly gentle slope, encountering several other ponds along the way. One pond was frozen, although Jay tells us that usually it’s salty enough that it remains unfrozen in November. Another pond was almost completely dried up, with only a tiny liquid puddle about a meter across hiding under a boulder. Frozen pond east of Don Juan. West of Don Juan is the steeper, much more boulder-rich surface of the flow lobe. It’s rough hiking, though not nearly as bad as the treacherously wobbly footing at Sollas Glacier. 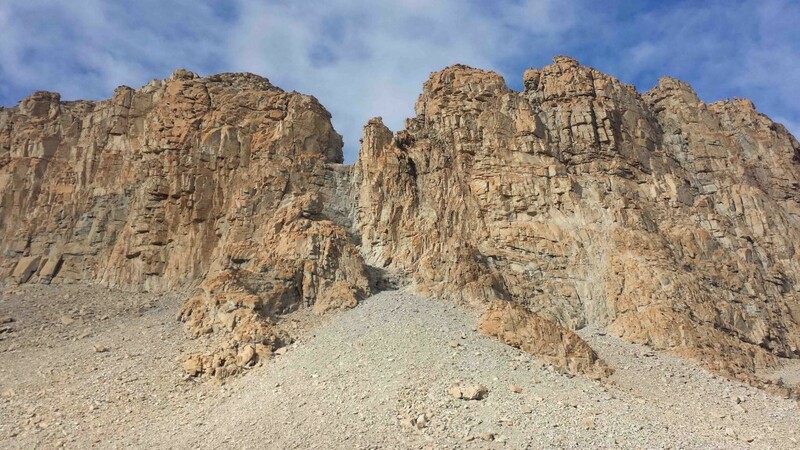 You’re surrounded by extremely steep cliffs, with bedrock looming vertically above scree slopes. There’s certainly plenty of sediment coming off of the cliffs to keep adding to the flow lobe. Looking toward the Asgards from South Fork’s main viscous flow lobe. We’ll spend the next two or so weeks here, and then this field season is done! Kate flying towards Wright Valley. We’ve moved to our final field location, the steep-walled, purple-hued South Fork of Wright Valley. 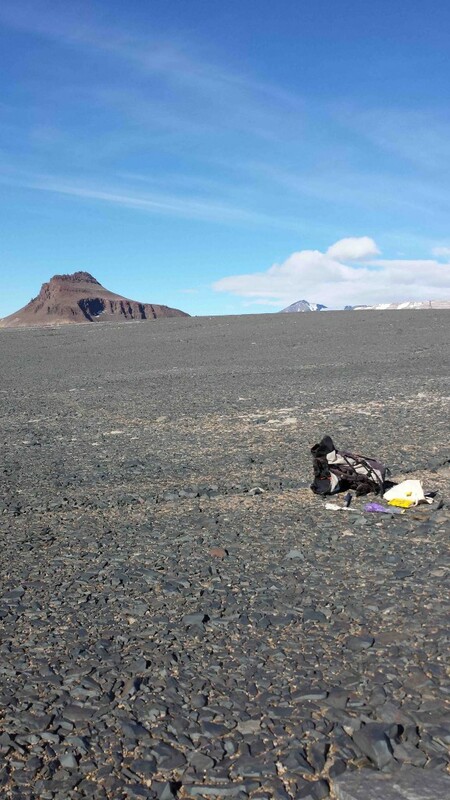 Coming from McMurdo, you fly across the Asgard Range into Wright Valley. The bedrock of the Asgards is striking, all pale oranges with dikes and thick sills. Long lobes of flowing patterned ground stretch along many of the valleys, adding a peculiarly geometric regularity to the place. Patterned ground in the Asgards. Lovely orange bedrock with dikes. 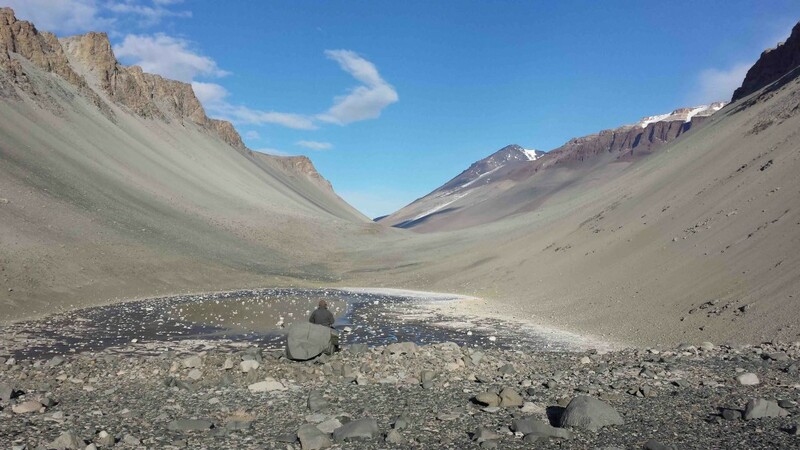 Just downhill of our tents is Don Juan Pond, the saltiest natural body of water in the world. Thus, I have had the pleasure of viewing Blood Falls and Don Juan Pond straight from the door of my Scott tent. South Fork, and Don Juan Pond in particular, is one of Jay’s favorite places in the world. The rest of us are getting pretty fond of it too, as IT’S ABOVE FREEZING OMG. Miracle of miracles, the Antarctic summer has arrived. Jay meditating on Don Juan Pond. Active helicopter rotors are terrifying, and one should abandon all shame and just duck the whole time you’re near them. If one is, for instance, in theory, pouring one’s pee bottle into a container in high winds, one would do best to stand upwind from said pour. Rotating between boots every two or three days lets you mix up blister locations. Canned fruit is much better than no fruit. A pee bottle with a frozen-on lid can be easily unstuck with two good whacks on a rock. 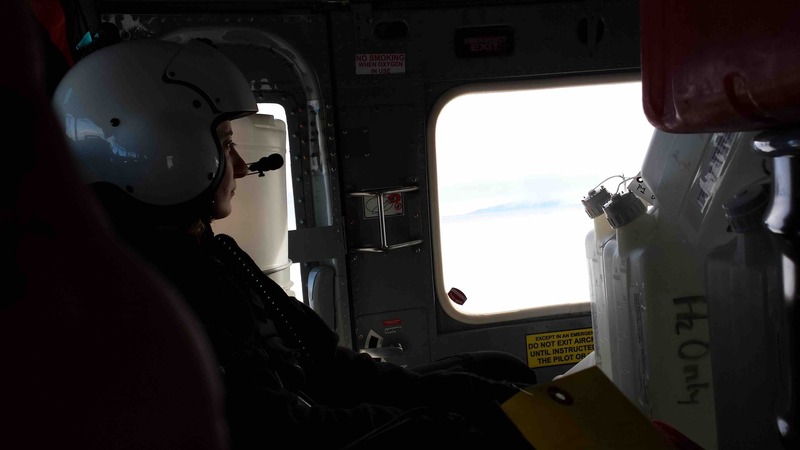 If you do not wear head covering while near a landing 212 Helo, your hair will be irrevocably swimming in fine sand. Unlike in normal life, a change of pants is more necessary than a change of shirt, because apparently my armpits emit no odor in the cold? Helo pilots and technicians are surprisingly not arrogant despite their awesome jobs, n = 6 or so. Never go outside in a windstorm without goggles. Never allow a full pee bottle to freeze. If a half-full pee bottle freezes, it takes approximately four re-uses to remove the frozen material. You didn’t actually lose the thing you’re looking for, it’s merely in one of Big Red’s many many pockets. Any gift in the field, even something so seemingly small as a cluster of apples from Rosalind at Crary IT, is the best and most gratefully received gift you’ve ever gotten. After a week with your camp using pee bottles, just assume that everything is covered in urine and then get over it. It’s sterile, right? Ok, that’s enough of that. I’m sure more urine talk will occur in the future. Rachel having a moment after receiving fresh fruit from Rosalind.